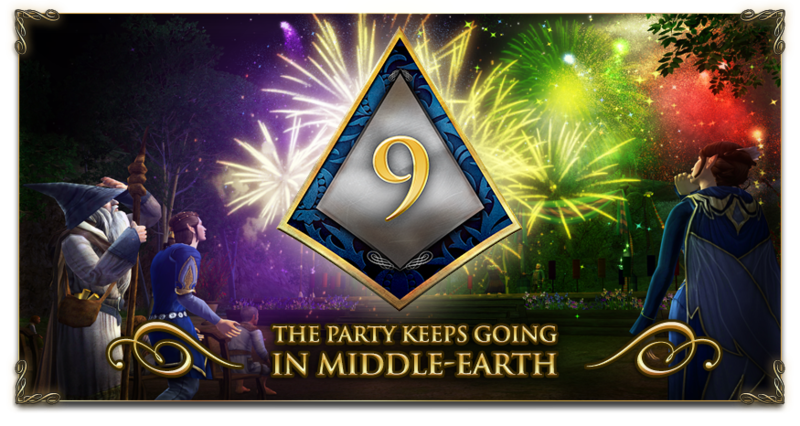 LOTRO's 9th Anniversary is approaching quickly and we want you to be a part of our celebration! We would like extend a gift as our way of saying thank you for joining us on our journey over the last nine years! During the Anniversary Festival, which runs from April 22nd through May 8th, all players will be eligible to receive gifts based on your account status* as of 11:59pm EDT on April 20th, 2016. Gifts will range from set of fireworks for all, to more exclusive items for our most steadfast premium and VIP players. Not a Premium or VIP player? Upgrade before April 20th to receive more anniversary gifts! Rewards will be granted based on your account status* as of 11:59 AM EST on April 20th. During the Anniversary Festival, all active players will be eligible to receive fireworks. You can carry these fireworks with you as a memento of our 9th celebration. Our Premium and VIP players will also be eligible to receive additional gifts for the highest year their account has been active. The gifts will be granted to your account at the beginning of our anniversary celebration in-game on April 22th, 2016. These will be based on the status of your account* as of 11:59PM EST on April 20th. Absolutely! There's still plenty of time to upgrade. 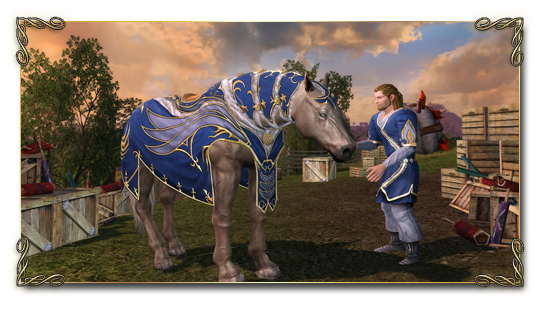 Simply become a VIP or make your first point purchase in the LOTRO Store to earn Premium status before 11:59PM EST on April 20th to earn additional anniversary gifts. Click here to learn more about the benefits of becoming a VIP. I have an old account but I haven't been playing on it. Will I still receive gifts from when the account was created? Absolutely. All eligible accounts will receive their respective gifts even if the accounts have been inactive. Do I have to log in to the game during the festival to receive my gifts? No. Even if you are unable to log in during the anniversary festival, you will still receive your gifts upon your next login. We think you'll want to join us for the festival though – it's going to be quite a party! *Account Status refers to the billing state of the account as of 11:59pm EST on April 20th, 2016. An account may reflect a billing state of VIP, Premium, Free Player or Suspended Account Status. Rewards will be distributed based on the original creation date of the account (the date the account was first created) as well as the billing state of the account (VIP, Premium or Free Player) at the time of account review at 11:59pm EST on April 20th, 2016. Account must be in good standing to receive rewards. Rewards have no cash value . You may see all of the individual Subscriptions on a single master Account by logging into https://myaccount.turbine.com/. Turbine, Inc.'s decisions are final and binding on all matters relating to the Anniversary Rewards Program. Turbine, Inc. is not responsible for lost, interrupted or unavailable network, server, Internet Service Provider (ISP), or other connections, availability or accessibility or miscommunications or failed computer, satellite, telephone or cable transmissions, lines, or technical failure or jumbled, scrambled, delayed, or misdirected transmissions or computer hardware or software malfunctions, failures or difficulties, or other errors or difficulties of any kind whether human, mechanical, electronic, computer, network, typographical, printing or otherwise relating to or in connection with the Anniversary Rewards Program, including, without limitation, errors or difficulties which may occur in connection with the upgrade of accounts.